Photo by Michael Kelly Andrew Lisk mows a customer’s lawn in Devola. 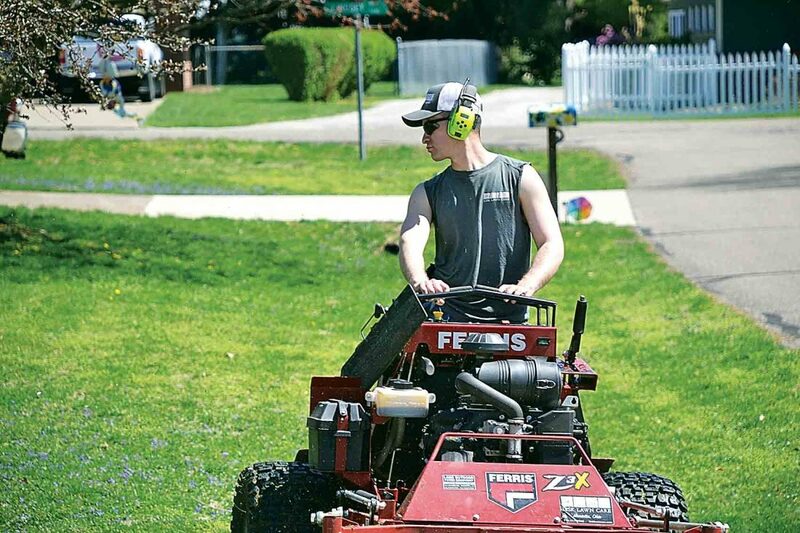 Lisk has established himself as a one-person lawn maintenance business, one of more than 1,000 businesses in Washington County that are classified as non-employers by the Census Bureau. Three out about every four businesses in the county are single-person enterprises. MARIETTA — Even as the population and the total number of businesses in Washington County has declined over the past decade, one element in business has gradually increased: the number of nonemployers, otherwise known as freelancers or independent contractors. According to Census figures for 2016, the latest year available on the bureau’s annual County Business Pattern data, nearly three of four businesses in the county are single-person enterprises. That’s 71 more than there were in 2006, when nonemployer businesses made up just over 70 percent of businesses in the county. In the same period the county’s population went down by more than 1,000 residents and conventional businesses – those with employees – went down by 167. Single-person enterprises cover a wide swath of professions, from lawn maintenance and independent building tradespeople to cosmetologists, graphic artists and even doctors. Dr. David Norris operates his chiropractic and wellness clinic out of an office in the Epicenter on Lancaster Street. Although he’s aware that a good employee could have significant value, there also are downsides, including the need for training, supervision and oversight that offset the benefits, he said. Norris said it’s helpful to be in Epicenter, which provides some office equipment and a group of congenial fellow businesspeople who are available for advice and discussion. The building has good access and parking for his customers, he said. Tasha Werry, director of Building Bridges to Careers, an agency that connects employers, community development agencies and the school system, said the Epicenter is part of BB2C’s efforts directed toward encouraging young people into the workforce, including those who want to go into business for themselves. According to the Census figures, there were 3,755 single-person businesses in Washington County in 2016. “If we could get a quarter of them to eventually hire one person, think of the job growth,” said Werry. Andrew Lisk established Lisk Lawn Care while he was in high school. “I started mowing lawns when I was in middle school,” he said this week. Lisk said he enjoys the work and the independence, although he occasionally hires someone part-time when it gets really busy. Pamela Lankford, executive director of the Epicenter, said the city is full of resources for people who want to strike out on their own rather than waiting to be hired. Lankford said the increasing trend toward single-person enterprises comes as no surprise as the economic climate and culture changes. The total receipts for single-person enterprises in Washington County in 2016 totaled nearly $153 million. One discouraging aspect of being in business as a single entrepreneur is the cost of benefits normally associated with employment. Lisk said he hasn’t needed to worry as yet because he remains on his parents’ health insurance plan until he’s 26 but it’s still a worrisome prospect. Norris said the cost of health insurance is formidable for a single proprietor but he became accustomed to paying for his own benefits as a traveling chiropractor who worked under contract. Under the Affordable Care Act, the cost of individual health insurance for people with low or moderate incomes is cushioned somewhat by federal government subsidies, but that assistance is now under threat by court challenges to the act. The actual cost of health insurance for freelancers or independent contractors can amount to several thousand dollars a year.